If you are searching for a lawyer because of an urgent legal problem, you may feel overwhelmed and vulnerable. You want someone who will respond promptly but who will take the time to understand your situation and address your concerns. You want a lawyer who can protect your interests and guide your decisions at every step of the legal process. At the Law Office of David D. Nowak, LLC , we believe in a client-centered approach to the practice of law. We treat every client with courtesy and compassion, and we guarantee personal attention and quality representation. We aim to empower clients with the solid advice necessary to make informed choices. Divorce, custody and family law — From marital property to parenting plans to post-decree modifications, we help you resolve disputes or protect your interests in court. Workers' compensation — If you were injured on the job, you should contact an attorney right away to uphold your rights to medical treatment and compensation. DUI/DWI defense — We provide aggressive, sophisticated defense in drunk driving cases for both the criminal charges and the administrative license suspension. Criminal defense — From traffic offenses to assault to drug crimes, we fight misdemeanor and felony charges to protect your freedom and limit the impact on your future. 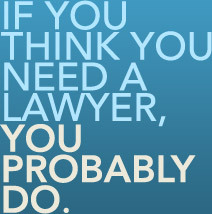 It's not a question of whether to hire a lawyer. It's a question of who to trust with your important and sensitive legal matters. Towson divorce attorney David Nowak has extensive trial experience and knows how to apply the law to your unique circumstances. His background as a former securities analyst enables him to address your investments and other sophisticated financial considerations in your Maryland divorce. The Law Office of David D. Nowak is dedicated to achieving the best outcome for every client. Contact us today to discuss your case. We offer a free phone consultation, and we can arrange evening or weekend appointments. Our expertise and integrity have earned us a reputation as the firm with the skills and track record to get the job done. Contact us via e-mail or phone to get started. Please verify that you have read the disclaimer. I have read the disclaimer. disclaimer . The Law Office of David D. Nowak is dedicated to achieving the best outcome for every client. Contact us today to discuss your case. We offer a free phone consultation and we can arrange evening or weekend appointments. The Law Office of David D. Nowak, LLC, in Towson, Maryland, serves the greater Baltimore area, including Baltimore City, Towson, Bel Air, Cockeysville, Columbia, Hunt Valley, Glen Burnie, Lutherville, Randallstown, Reisterstown, Perry Hall, White Marsh and surrounding communities of Baltimore County, Anne Arundel County, Harford County and Howard County.